Decolorizing variety of Chrysoberyl BeAl2O4. Solidity of Chrysoberyl 8,5 and he is one of the hardest minerals. From navy blue to emerald-green by the daily light to purple and purple-red at lamplight. If Chrysoberyl on composition exactly corresponds the chemical formula, it is clean and colourless. Almost unchanging substituted for part of aluminium oxydic iron Fe and chrome, and part of beryllium - by protoxide iron Fe. Colouring is caused the admixtures of chrome and iron Fe. The different tints of colouring of Chrysoberyl are conditioned exceptionally these second-rate admixtures. Alexandrite is the most valuable and dear variety of Chrysoberyl. Has the bluish-green, grass-green or thick olive-green colouring. Ural Alexandrite have the bluish-green colouring, stone from Ceylon possess a thick olive-green color. Solidity of alexandrite 8,5 allows to distinguish him from other minerals, also decolorizing at different illumination or rotation of stone. In the ultraviolet rays of Alexandrite sometimes shine a red color. In Russia a wide fame was got by unique Druse of alexandrite, found on Ural - Druse P.A.Kochubeya measuring 25х15 sm with perfectly well-educated crystals by a size 6х3 sm, rifle-green color, but practically opaque or faintly transparent. In Russia Chrysoberyl extracted in passing at development of deposits of emeralds. Ural Alexandrite was considered the best and were the standard of quality. Last years Chrysoberyl, especially Alexandrite, very rare. Presently their regular booty in extremely small scales is conducted in Sri Lanka, India (state Kerala), Brazil. Aleksandrity from Brazil, supplied to the market, have more pale tint and insignificant game of color unlike the famous Ural stone. A green color can have a weak reddish tint depending on that, how light falls on stone. On a photo synthetic materials is above resulted (alexandrite Corundums and Spinel). Natural Alexandrite change colouring from green and greenish to reddish, unlike synthetic materials (which changes a color from dark blue and greyish to rose). In some light natural the Alexandrite transition of color is barely visible. Sometimes characteristic for a natural alexandrite is discoloration at the rotation of stone at permanent illumination, when light passes through stone in different directions. Stone differently takes in light in various directions. Transparent, transparent with glass brilliance, Alexandrite possesses noticeable pleochroism. Violet-red correspond the least, middle and most indexes of refraction, orange-yellow, gold and emerald-green colors. All of these colors differentiate expressly, especially first and third. The wide bar of absorption begins in a green area and extends further in a red area. Other striaes of absorption almost unchanging. Such spectrum is related to the presence of chrome. Distinction in the spectrums of absorption for different rays at an alexandrite engulfs the interval of visible spectrum which an eye is most sensible to, the light emitted an alexandrite is mixture of red and green light with a rejection on some directions in a crystal to red. This equilibrium is so thin, that stone seems green at daily illumination and reddish at artificial, which large intensity of red rays is characteristic for. Ability of alexandrite to change a color is the feature of perception of our eye. Chrysoberyl. Lak-Alaotra. Madagascar. Photo: © M. Moiseev. 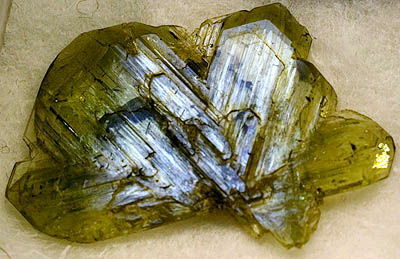 At daily illumination of Alexandrite imported origin can have gray-green or saturated green color, that depends on maintenance of chrome, which is different at minerals from different deposits. A green color can have a weak reddish tint depending on that, how light falls on stone. However if Alexandrite to place under artificial light, especially going from a fluorescent lamp, stone red. If this mineral to revolve or change the terms of his illumination, lengths of waves of light will change, arriving at our eye, and even small changes can be sufficient, to influence on looked after the eye of people color of stone. Presently Alexandrite of good value (not fastened in age-old wares) meet extremely rarely. Many synthetic Alexandrite in actual fact are or by synthetic corundums, painted vanadium and possessing the lilac-tinged colouring, replaced more red at lamplight, or synthetic spinels, having more thick green colouring. In 1973 wares with synthetic Alexandrites, which showy discoloration is also characteristic for, appeared on sale, but from purple-dark blue to rose, but not from green to red. Technologies of growing of Alexandrite from solution in fusion (near to natural) are difficult and costly, at price of such stone approaches natural and is no less valuable and dear. 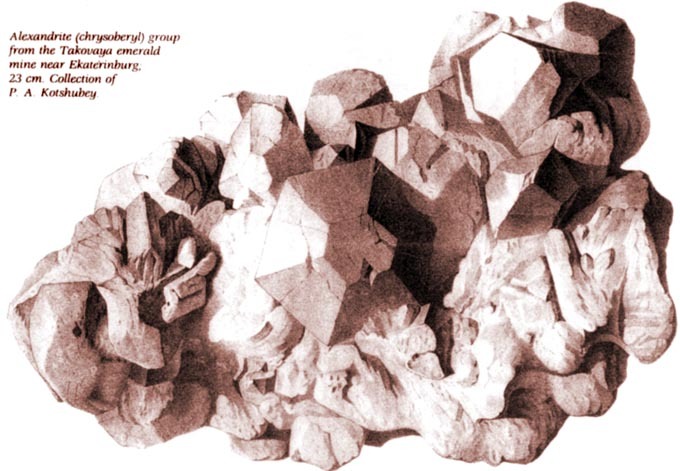 Most widespread cuttings for an alexandrite - step or diamond dropwise. "Cat's Eye" is processed cut as cabochon. It is widely used in dear jeweller decorations, often jointly with diamonds, emeralds, Pearls. The weak game of light at ordinary daily illumination and remarkable change of colouring, looked after at lamplight, shrouded this dark the stone cover of secret. Talisman of people, sufferings the change of mood: stone can change a color not only depending on a daypart but also depending on the mental condition of proprietor. Looking after changes, it is possible to learn beforehand to warn emotional derangements. It brings calming, normalization of relations between people, promotes, that an owner came in an equilibrium quickly after all of stress situations. As amulet charm Alexandrite good for those people which are pursued by troubles, it is instrumental in the maintainance of relations, financial prosperity and enables to accumulate riches. The proprietor of stone can become a prosperous people both in sociality and on the state a health.